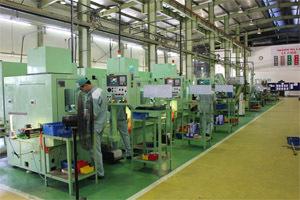 Konishi Seisakusho has a base in Vietnam and is manufacturing the jigs and the machine parts which are cheap and stabilized. Because more than the half of the workers in there have been given training in Japan and mastered basic technology. We are producing consistent products. 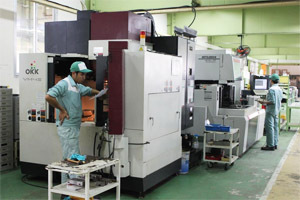 We are proud of our skills for highly precise parts works. We accept an order of a part of every field with technology of super precise works and having a good command of each grinder, mainly parts for automobile, household appliances and electronics. We have been selling original products by challenge to precision work and we think that it is very important subject for us to secure a keeping a good quality and appointed date of delivery shortening, Customer Satisfaction No.1to get customer’s trust. We think that education training of technical improvement is important for this purpose. 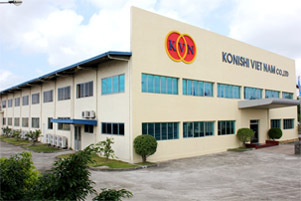 Konishi Vietnam is supported by the ability of an engineer and machinery. Our senior engineers who are proud of expert technique are teaching their skills and techniques thoroughly with original one-to-one guidance method to polish their skills at the employee training. We try to make them to become a full fledged person in three years. We have newest equipment as orbit super finishing machine, internal honing machine, vertical surface grinder, three dimensional measuring machine, outline shape measuring instrument and concentricity shape gauge. We will never give up even if asked for any kind of difficult work. We will challenge to more difficult work and more value-added high work for the future. We will challenge to produce the manufactures for the future and Technology, energy, technology corresponding to a pollution issue will become important. Our dreams are open more greatly towards the future. Copyright © Konishi-Seisakusho Co.,Ltd. AllRights Reserved.